The world is rushing toward a day of judgment like nothing we have ever before experienced. Jesus called it a time of “great tribulation, such as hath not been from the beginning of the world until now, no, nor ever shall be” (Matthew 24:21). The Apostle Peter predicted that all the things man has created will be destroyed with a consuming fire, wherein even the very elements themselves will burn (2 Peter 3:7-10). The Bible vividly and repeatedly describes a nuclear holocaust that will occur as a result of the battles of the last days, which ultimately will lead to the final battle of Armageddon. It also describes an even worse period where God’s wrath will descend upon those who have destroyed the Earth as well as upon every person that has followed the Antichrist and received his Mark. As Jesus was dying for our sins, two other men were suffering death for their crimes. One of them mocked Jesus, while the other one acknowledged his sins and asked the Lord to simply remember him when he came into his kingdom. Jesus not only answered him, but promised that he would be with him in paradise that very same day! This passage illustrates how simple it is to obtain forgiveness from God. This is why the Bible calls it “Good News”, which is translated in our Bibles as “The Gospel”. The truth is that Christ saved us from judgment by sacrificing himself and that all we need to do is acknowledge our sins and ask him for forgiveness. 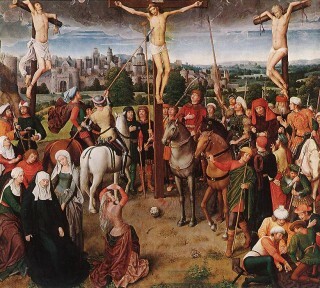 The thief on the cross obtained safety from judgment during the very last moments of his life. We too can avoid God’s judgment by following this very same act of faith. The amazing thing is that it requires no payment or work on our part—Jesus paid for it all upon the cross. That’s why the Lord didn’t require anything more of the thief; Christ was paying for it, not us.